Der Artikel Joseph Haydn (1732-1809): Sämtliche Klavierwerke wurde in den Warenkorb gelegt. 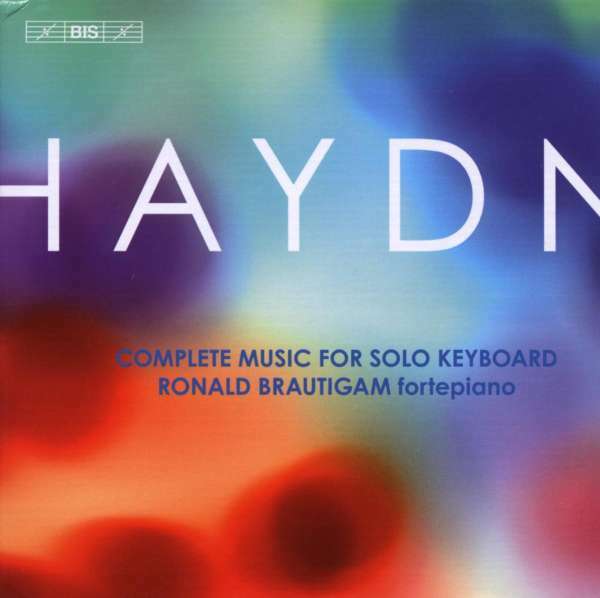 In a recent review of his recording of Beethoven Piano Concertos, Ronald Brautigam was described in The Times (UK) as ‘the king of that strange period beast, the fortepiano’, whose Beethoven playing has ‘made numerous listeners reassess their feelings about the short-breathed jangle of the fortepiano sound’. 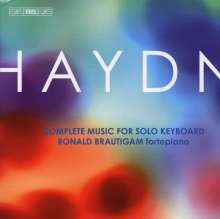 This description holds equally true for Brautigam’s Haydn interpretations, as proven by the present collection of Haydn’s complete music for solo keyboard: the extant 55 sonatas as well as sets of dances and variations and various independent pieces. 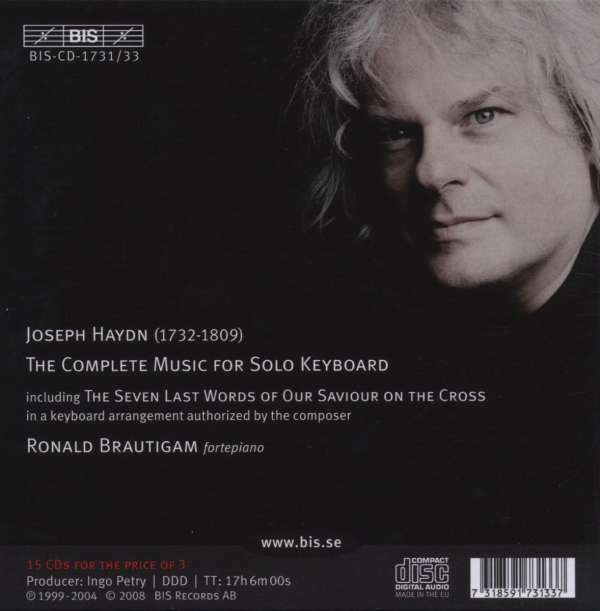 Included is also an unusual keyboard arrangement of The Seven Last Words of Our Saviour on the Cross, published in 1787 with the composer’s approval. These recordings were originally released between 1999 and 2004, in instalments which received universal acclaim, including a Cannes Classical Award in 2004. Provided with a new essay by Haydn biographer Marc Vignal, they have now been gathered in a boxed 15-disc set as part of BIS’ celebration of the coming Haydn Bicentenary. Sonate Für Klavier Nr. 49 Es-Dur Hob. Xvi:49 "genzinger Sonate"
Sonate Für Klavier Nr. 50 C-Dur Hob. Xvi:50 "londoner Sonate"
Sonate Für Klavier Nr. 51 D-Dur Hob. Xvi:51 "londoner Sonate"
Sonate Für Klavier Nr. 52 Es-Dur Hob. Xvi:52 "londoner Sonate"
Hörprobe Track 1: Capriccio G-Dur Hob. Xvii:1 "acht Sauschneider Müssen Sein"
Capriccio G-Dur Hob. Xvii:1 "acht Sauschneider Müssen Sein"
Hörprobe Track 11: 7 Variationen Und Tempo Di Menuetto F-Dur Hob. Xviia:1 "il Maestro E Lo Scolare"
7 Variationen Und Tempo Di Menuetto F-Dur Hob. Xviia:1 "il Maestro E Lo Scolare"
Hörprobe Track 5: Sonate Nr. 4: Deus meus, Deus meus et quid dereliquisti me? Sonate Nr. 4: Deus meus, Deus meus et quid dereliquisti me?